"The weather was perfect in sunny San Diego for this year’s Amerivespa. 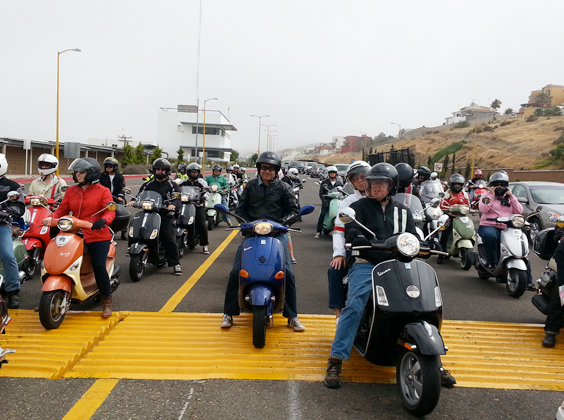 An estimated 2,000 Vespa and scooter enthusiasts invaded San Diego for VCOA’s annual scooter celebration. Over the four day event six scooters were raffled off in addition to many other prizes donated from our sponsors. Thursday’s highlight was the evening meet and greet at Vespa Motorsport, the local Vespa shop and co-sponsor of Amerivespa. About 500 early arrivers enjoyed food, drinks and an art show and a raffle which featured a custom Vespa LX150 to one lucky recipient, Rich Glass of Vespa Club Los Gatos. Every day would start out with a choice of rides that were led by local scooter clubs. The highlighted ride was the Friday ride across the Mexican border to the seaside town of Puerto Nuevo. It was only a 140 mile round trip, but ended up as an all-day venture as the return trip back across the border to the USA was a slow checkpoint for every scooter. The heat rose to close to 100 degrees, but everyone made it back and checked off “Scooter Ride in Mexico” off their bucket list. Friday was also the start of the two day vendor show with many of the local and national brands exhibiting their products replete with plenty of giveaways. The show would end on Saturday with the traditional scooter concourse and gymkhana. In the evening, a concert and dance at Town and Country Resort was headlined by the English Beat who provided some great music to dance the night away. Saturday, the vendor show and concours de elegance continued with the most attendees visiting on the weekend. Our Saturday evening awards and dinner banquet featured a fashion show, stand-up comedy by former owner of NOHO scooters, Mike Frankovich, two scooters raffled and music from the Inciters. Mike Bobadilla announced that he was resigning as president of VCOA and that the new president would be Jac Carolan from New Orleans. Sunday the final ride was to Paradise Point for our closing raffle and BBQ. Our party was curtailed quickly by the park rangers who called in the local police for reinforcements. It seems someone forgot to secure permits. “Oops!” We were asked to leave the grounds. No problem. Everyone got back on their scoots and reconvened at Vespa Motorsport. Our version of a moveable feast moved quickly to our improvised location. The final BBQ and raffle was completed and another Amerivespa was completed. Next year Amerivespa returns to New Orleans. Hope to see you there!" For the "official" pics from AMERIVESPA, click this link.